Ronnie O’Sullivan is just three frames away from winning the Dafabet English Open as he leads Kyren Wilson 6-2 after the first session of the final. O’Sullivan made two centuries and four more breaks over 50 as he took control against Wilson, who crucially missed a tough black when he could have gone 2-1 up. Victory tonight would give Chigwell’s 41-year-old O’Sullivan his first ranking title for 20 months and the 29th of his career, which would bring him level on the all-time list with John Higgins. In his 43rd appearance in a ranking final, O’Sullivan was off to a fine start with a break of 115 to take the opening frame. Kettering’s 25-year-old Wilson, whose only previous ranking title came at the 2015 Shanghai Masters, hit back with a run of 74 to make it 1-1. Frame three came down to the colours and world number 15 Wilson potted an excellent long pink but left himself a tough thin cut on the black, and left it in the jaws of a top corner. O’Sullivan slotted it home to regain the lead. A 131 from O’Sullivan, his tenth century of the tournament, put him 3-1 ahead at the interval, then Wilson responded with a 109. O’Sullivan dominated the remainder of the session, winning three frames in 27 minutes. Breaks of 77, 87 and 96 extended his advantage to 6-2. 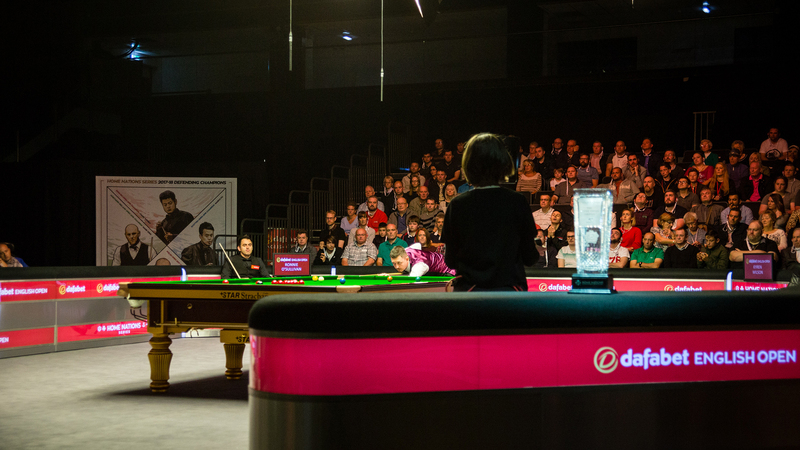 The final resumes at 7pm with first to nine frames to win the Steve Davis Trophy and £70,000 top prize.